Smoking is today considered a nasty and unhealthy habit causing many damaging effects to the smoker himself/herself. It is also considered a potential detrimental factor to people who do not smoke but are exposed to secondhand smoke. Heavy smokers as well as those who smoke for a long period of time increase the risk of some medical conditions. Namely, they are highly likely to develop cardiovascular disease, some types of cancer and several serious respiratory illnesses. Apart from these major negative effects tobacco smoking can also interfere in some other functions of the body and cause serious complications. One of the most serious diseases that develops as a consequence of smoking is cardiovascular disease. This is actually a group of diseases all of which include narrowing of the heart arteries or other arteries in the body due to build-up of plaques (fat deposits) in the wall of the affected blood vessels. So people who smoke are prone to atherosclerosis and may eventually develop coronary artery disease or even end up with a heart attack or even stroke. Apart from being responsible for accelerated atherosclerosis smoking also makes one more susceptible to thrombosis and blood clot formation. This is why smokers more often develop blood clotting disorders. Smoking is closely related to the occurrence of certain cancers. Direct impact of smoking is evident in case of lung cancer, cancer of the tongue, lips, oral cavity and throat. The risk increases with a higher number of cigarettes smoked per day. Heavy smokers are the main group of people who eventually develop COPD (chronic obstructive pulmonary disease). It is scientifically confirmed that emphysema and chronic bronchitis most commonly affect smokers, to be more precise heavy smokers and individuals who have cherished this habit for a long period of time. Apart from the previously mentioned, there are several more detrimental effects of smoking. Smoking accelerates the process of aging and may cause early appearance of wrinkles and other age-related skin imperfections. Furthermore, smoking is considered a habit which requires strong determination to be eradicated. People who smoke are more susceptible to elevated blood pressure. This habit is also potential culprit of infertility in some couples. Impotence and erection problems may also occur. People who are suffering from asthma and who smoke may cause worsening of the inflammation of the airways. Smoking is also a potential contributor to macular degeneration meaning that it may be associated with gradual loss of vision. 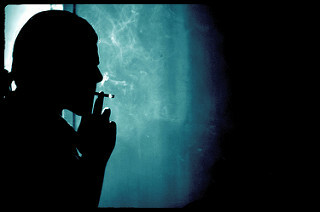 It is also believed that smokers suffer more from cataract than non-smokers. And finally, cigarette smoke stains the teeth and gums and is considered a major contributor to periodontal disease.